Finally, it’s October. Along with all that Fall outside weather stuff I’m not really interested in (except for the cooler temps…THAT I am always interested in) is something that always catches my nose…..the smell of cotton candy, corn dogs and funnel cakes! Ahhh, YES! That’s a Season I can get into! Of course I’m talking about the County Fairs, the Fall Festivals on every town square and random funnel cake stands on the corners of various roads spread thru the hills and valleys of small towns everywhere. You got a Funnel Cake-mobile? Then stop right here and set up ~ we’ll let you sell funnel cakes in the parking lot of the gas station ~ no problem! There’s a Huge County Fair in the next county over. And really, if I’m going to the County Fair, it’s possible I’ll do and see things I would rather keep private…so the next county over? A very good thing. Now it was early so we didn’t get to see all the freaks that go along with a Friday night crowd at the fair, but we did see plenty…. Like the pig races. Yes, that’s what I said ~ the pig races. They were little pigs, and then there were littler pigs (yes, I know ‘smaller’ is the correct word, but I like ‘littler’…it’s ok, it’s my page). I don’t know any of these people…but they sure were having fun! Next the Pig Racer Announcer called for the last race before the rain got us totally soaking wet (instead of just sorta wet, like we were at that moment). As he talked about the next racers, he began describing them….the have long necks (giraffes? ), they have feathers (ostrich? ), they have 2 legs (swans? )…Oh for Gawd’s sake, just tell us already.. Yes! The next racing animals were ducks! 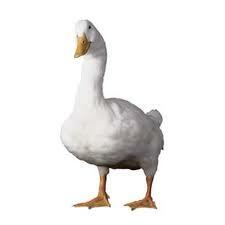 Now the ducks that were racing weren’t quite as pretty as our Aflac duck here…but they were in fact ~ ducks. Trained Ducks. 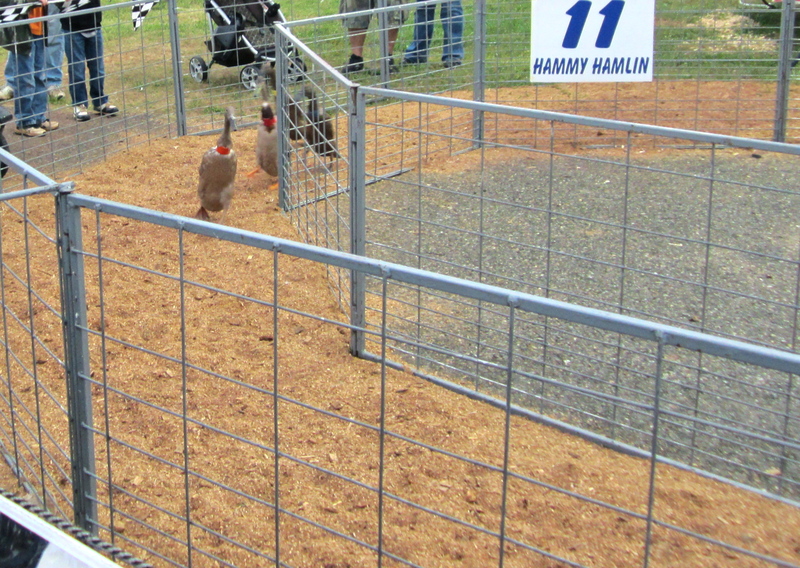 Ducks that waddled walked fast raced down the little ramp from the trailer and into the running lane cage thingy. They were ready to race til the bitter end. Except ducks can’t really race, at least they can’t race very fast…because they’re ducks and they only have two legs. And on those two legs are webbed feet. Perfect for water but not all that fast on land. On a sawdust covered, sorta oval track-like device with lots of crazy people in various redneck-logo’d t-shirts yelling at them. At least it was raining. 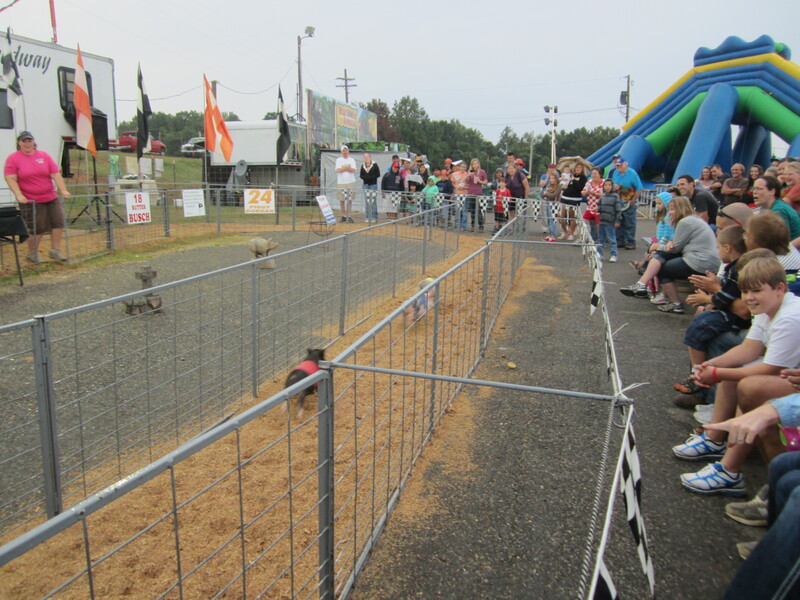 Of course I got a picture….how often do you get to see duck races! But I think the most wacky crazy freaky interesting thing I saw was Fat Albert. NO! Not the cartoon character or Bill Cosby. Fat Albert is a white mouse. He’s probably many mice, but only one works at a time, probably due to some mouse-labor law or something. Or they’re small and get tired easily. But this is what happens: Fat Albert is placed on a spinning round table marked with colored stripes. 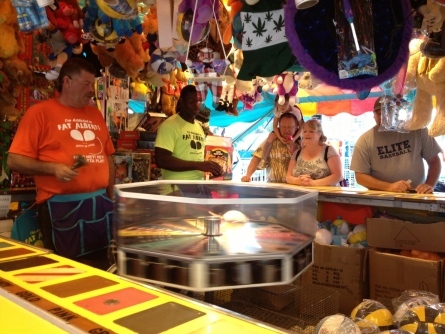 Suckers Players step up to the booth, placing quarters on colored stripes, guessing which colored hole Albert would run into first. Winners get a little gold, worthless token they can trade in for prizes…you know: only 138 tokens for a stuffed teddy bear that’s 6″ high and cost 15c from Oriental Trading. You really have to see this to believe it….Albert is in a tin cup and his ‘trainer’ holds the cup in his hand and starts spinning the table and then sets the tin cup in the middle of the table. He rings the famous Fat Albert Bell, says, “Hey, Hey, Hey, it’s FAT ALBERT”, removes his hand from the cup and Albert jumps out of the cup and runs into the nearest hole on the table. Under each hole is another tin cup that he rests in until it’s time to play again. AMAZING. And GENIUS! People are lined up all the way around the booth, just jumping at the chance to bet on a mouse that’s probably so used to the bell he sleeps between rings. I heard one woman say they have a $20 limit for Albert, just because it’s so exciting. I refrained from responding…aren’t you proud! The rain really started pouring after Fat Albert ran his course a few times, so we ducked under a shelter, had our hot dog, funnel cake, bloomin’ onion and cotton candy and headed to the house. Another fall, another county fair….and may all the white mice rest in peace tonight. Sweet mama, I love a county fair. It is better people watching than Wal-mart on Black Friday. I have seen the white mouse betting tables before, but never the animal races. We’ve seen bored farmer kids racing, though. And creepy dirty magicians. Good times. It is definitely better people watching than anywhere else! And bored farmer kids were everywhere ~ lucky for us I didn’t see any creepy dirty magicians…they were hiding-ha! Good times indeed!